Whether you’re just starting your consulting business, or you’ve been in the game for a while, all consultants face the difficult task of finding clients. Thankfully, the rise of content marketing and social media has made selling your services online much easier. The first thing you need to do before venturing onto social networks is to make sure you have a solid website and content marketing strategy. Social media helps with the promotion of your content and website, and you need these assets to back up your social media engagement and conversations online. After all, when was the last time you got sold something on social media without going to a website? In this post we’ll explore tips on how to find clients using social media and direct them to your online properties. To get started on social media, you need to have a social media monitoring tool. Once you’re all set up, some examples of social media monitoring tactics you can use include monitoring for brand or product mentions, following relevant hashtags, monitoring for mentions of your Twitter handle, and monitoring your competitors. You can create countless opportunities on LinkedIn by joining groups that meet your business interests, but only if you engage within those groups. Answering and asking questions in groups gets you noticed professionally. 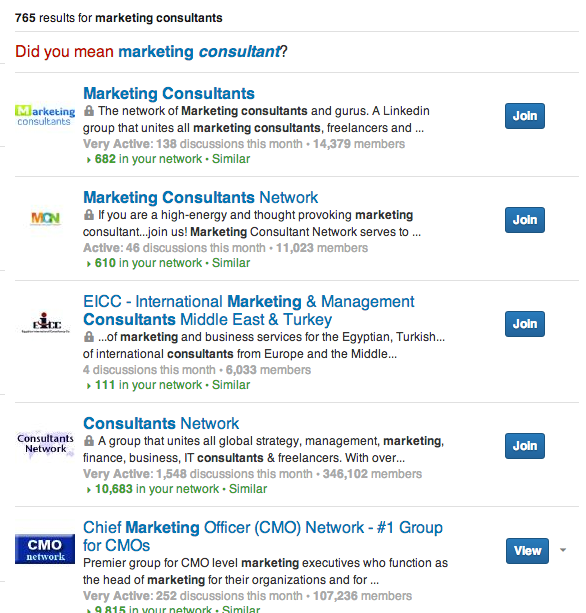 You can search for appropriate groups and join in their discussions to grow your network. Within the group you can ‘follow’ individuals so you have the opportunity to exchange ideas. When that bond has been built, you can ask them to connect. Doing so allows you to build up a network of potential clients. Facebook events are a great way to scope out the attendees at upcoming conferences or events that are in line with your business. In Facebook’s search bar, you can look up “Marketing Conference”, and under events you’ll be able to see a list of upcoming Marketing Conferences. This is a great way to find conferences you should attend so you can grow your network, therefore increasing your potential client base. When you do decide on a conference to attend, be sure to review the attendee list and do your research on potential clients you will want to speak with. Events can also be time-consuming and expensive. If you don’t have the room in either your calendar or your budget, social media can tell you who’s at the events that matter, so you can connect with them in the online hotel lobby (Twitter!). Even if you have a small budget, Facebook or Twitter ads are a great way to increase the reach of your brand. Consultants can pay Facebook to show custom ads to a specific audience, with costs varying based on the number of clicks and the reach of the ad. Facebook allows you to hone in on your audience and target your Facebook ads to a specific demographic of people that you consider quality leads. For Twitter ads, there are three different kinds: Promoted Accounts, Promoted Trends, and Promoted Tweets. The one consultants should focus on are Promoted Tweets, which are messages that will appear directly in the timelines of the Twitter users you targeted. Twitter ads allow you to specify who sees your Tweets, increasing your chances of reaching your objectives and finding potential new clients to engage with. Make sure to have your Facebook Page and Twitter pages optimized so that when people land back on your social media assets, they’ll immediately see that you are a professional, someone they would entrust with their business. Now that you know how to find clients on social media. Find more clients with Hootsuite Pro.